The most used word shipping today is: security. IceWarp server of course offers the highest standards in this area. This document covers the best practices about server certificates useable in that software however it doesn’t cover the client side certificates and encryption of messages. Asymmetric cryptography uses public and private key pair exchange to sign and/or encrypt data and it underlines the internet standards as SSL or its successor TLS. Certificates are usually issued by Certificate Authority (CA) but in default IceWarp server utilizes his own self-signed certificate for secure transfers as HTTPS, SMTPS and others. But you can of course your own. In the Administration console you can find CA certificates Tab. Because IceWarp server doesn’t use Windows certificate store you can add the certificates you want to trust here. This part of tutorial uses the well known Certificate Authority VeriSign, but most Certificate Authorities, such as Thawte and GeoTrust, also have free trial certificates. The only difference will be the ordering process. A free Trial SSL Certificate from VeriSign has a 14 day validity period. This should be plenty of time to evaluate its use on the Icewarp Server, and to familiarize yourself with the broader issues of SSL certificates. 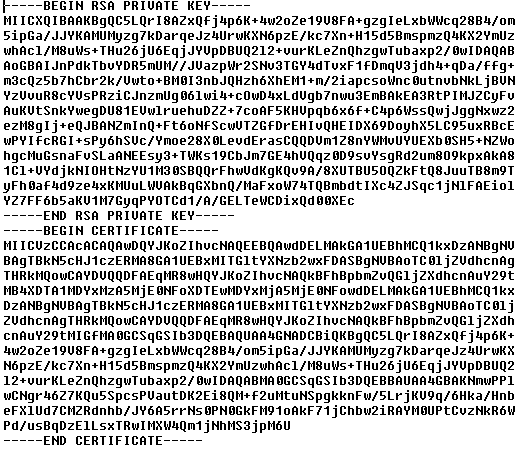 Generating a CSR (Certificate Signing Request) and Private Key. Merge the signed Certificate from the CA with the Private Key. Generating CSR (Certificate Signing Request) and Private Key. Open the Icewarp Administration console and go to the [System] [Certificates] "Server Certificates" tab. Press "Create CSR / Server Certificate…" and complete all fields in the form. 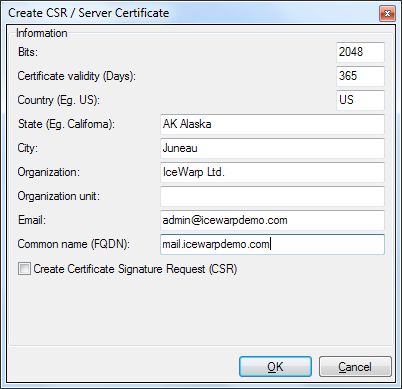 Check the box "Certificate Signature Request (CSR)" - otherwise the Icewarp Server will generate a self-signed certificate instead of the CSR. Press OK and choose the destination for your certificate request file. When requesting a certificate it will be necessary to use a real e-mail address as the certificates will be sent to that contact information. When you are asked for your CSR you should cut and paste the content of the cert.csr file that was generated in step 1. This file can be opened with any text-based editor (such as notepad). For a Windows/IE browser double-click the certificate to install it. For a Firefox browser go to the Tools, Options, Advanced, Encryption, View certificates, Import. (Drop down menus in Firefox). Once done all certificates signed by Verisign's Trial Certificate Authority will be considered as trusted by the browser. (This step is not necessary when a non-trial certificate has been purchased). Above: example of mycert.pem file. Note1: You can of course merge your root certificate into the chain to propagate it to the clients. In that case run "copy private.pem+signedkey.pem+trialroot.crt mycert.pem"
Note2: Some CA (like Comodo) uses intermediate CA - an another certificate. In such case you need to join all these 3 (or more) certificates in the correct order - Private, Signed Public, Intermediate(s) and root (optionally) together - "copy private.pem +signedkey.pem+intermediate.pem+trialroot.crt mycert.pem"
Once the mycert.pem file is created it needs to be imported into the Icewarp Server. Open the Administration GUI and go to [System] [Certificates] Server Certificates tab and click the Add button. Insert the IP address that this certificate is intended for. This will be the IP address that the Icewarp users are directed to when they access this server. Insert the fully qualified name of the certificate file (full path to where the file is being stored. It is suggested that the certificate be stored in the \Icewarp\config directory). To apply the new certificate a restart the Web/Control service is necessary. To Test this new certificate open up a browser and go to https://mail.yourdomain.com/webmail. Be sure to use s https instead of http. The default SSL port is 443 or optionally 32001. This is probably caused by error in certificate chain. You can use OpenSSL tools to verify your certificate and private key. Download it fromhttp://www.slproweb.com/products/Win32OpenSSL.html (Windows) or use your installer for Linux package. Install it and run form commadline: “openssl s_client –connect remotehost:port” where remotehost is your IP address and port is SSL port of your web service (usually 443). You shout get two numbers (md5 hash of modulus part exactly). If these numbers match you have almost 100% certainty that you have a correct pair.